Each October AESU likes to explore the strange sides of well-known, destination cities. For our final week, let’s explore the history of the Pére Lachaise Cemetery and its paranormal occurrences. Want to see a ghost? 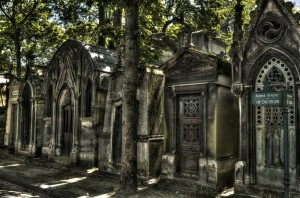 The Pére Lachaise Cemetery tops many lists as the most haunted place in Paris. Père Lachaise is the largest cemetery in the city limits with over 300,000 bodies buried there. It’s located in the 20th arrondissement and named after Père Francois de la Chaise, the confessor to Louis XIV. It has been around since 1802, covers 110 acres and its tombstones are of some of the most beautiful and ghoulish sculptures around. It’s the final resting place of notable artists, politicians, and musicians, like Edith Pilaf, Oscar Wilde, Marcel Proust, Gertrude Stein, Pissaro and Chopin. Even Jim Morrison is interred in the Pére Lachaise Cemetery. One of the eerie grieving sculptures in the Père Lachaise Cemetery in Paris, France. Why are so many famous people buried here? Burial spaces were scarce during the latter part of the 18thcentury and Parisians were afraid of rotting corpses contaminating Paris’s drinking water. To fix these issues, urban planners decided to move graves from the inner city to the outskirts of Paris. The idea of being buried so far outside the city center wasn’t popular, so the graves of famous people were relocated to Pére Lachaise to increase the cemetery’s status. Once the prominent graves were moved, Pére Lachaise Cemetery became the place to be buried. Visitors regularly report spooky occurrences here. Jim Morrison of the Doors is often seen wandering near his grave. The ghost of Adolphe Thiers, prime minister under King Louis-Philippe in the 19th century, tugs on visitors’ clothes if they walk too close to his resting place. Others see spectral lights and translucent figures roaming through the cemetery. Historians would also enjoy a visit to the Pére Lachaise Cemetery. It was the site of a battle during WWI and if pay attention you can see bullet holes in some of the tombstones. The cemetery also features several monuments to Holocaust victims and those who were killed during WWI and other wars. 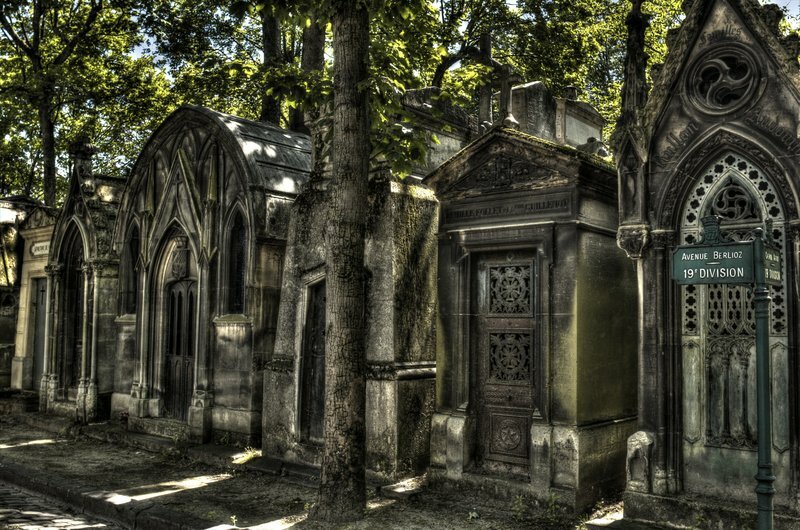 The Montmartre Cemetery is another cemetery on the outskirts of Paris that was created in the 19th century to alleviate sanitation concerns. Montmartre Cemetery and its ghosts aren’t as famous as Pére Lachaise but it has a much spookier vibe. Its densely packed mausoleums, overgrown shrubbery and stray cats make it a foreboding contrast to Pére Lachaise’s manicured, park-like appearance. Montmartre’s distinctive mausoleums are a necessity rather than a creepy style choice. The land where Montmartre resides was originally excavated as a gypsum quarry, so the majority of it is below the street level. This low elevation made burying bodies underground impractical; besides, there were already a lot of bodies buried in Montmartre. During the French Revolution the abandoned quarry served as a mass grave for soldiers who fell during the battle. Montmartre is also the final resting place of the artist, Degas, the writer and playwright, Alexander Dumas, and the actress/singer, Dalida. As the final resting place for many artists, actors, scientists, politicians, and others, Père Lachaise and Montmartre Cemeteries are a must-see when visiting Paris. Take a tour after the dark and explore the spooky side of the city of lights! AESU offers unique, exciting travel programs for college students and young professionals at affordable rates. Each trip is action-packed and informal—designed just for people your own age. We are also able to design custom tours just for your group. AESU offers several trips to Paris, France, including: Cosmopolitan, Explorer, Euro Focus, Great Escape, and Euro Spree. 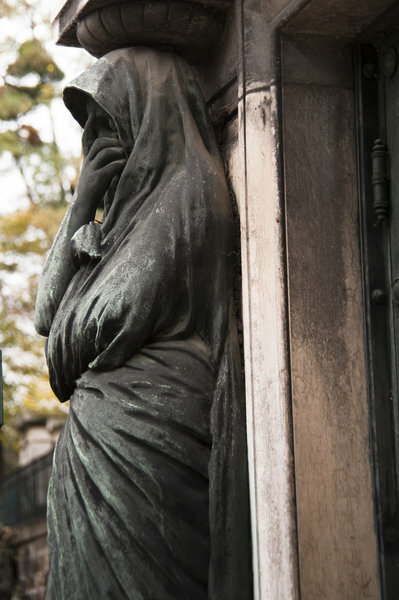 All our tours in Paris have the chance to go to Pére Lachaise to see where history was made. If you have any questions or want help booking your Paris adventure, please contact AESU by calling 800-638-7640, or fill out the contact form found on our website. Travel with us on Facebook ▸ Twitter ▸ LinkedIn ▸ Google+ ▸ Pinterest. This entry was posted on Thursday, October 29th, 2015	at 11:00 am	. You can follow any responses to this entry through the RSS 2.0	feed. Both comments and pings are currently closed.